Chinese President Hu Jintao in Beijing Tuesday visited the Liberation Army Daily, the newspaper of the Chinese People's Liberation Army, to congratulate it on its 50th founding anniversary. 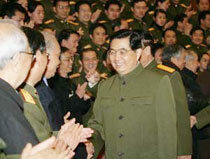 President Hu Jintao visits and greets the staffs of the Liberation Army Daily, the newspaper of the Chinese People's Liberation Army in Beijing Jan. 3, 2006. Hu, also general secretary of the Communist Party of China Central Committee and chairman of the Central Military Commission, said the newspaper should advance with the times and better play its role in educating, encouraging, and mobilizing. It should also further contribute to national defense and the building of the military, thus helping the whole nation build up a moderately prosperous society. Hu's entourage included Guo Boxiong, Cao Gangchuan, Xu Caihou, Liang Guanglie, Li Jinai, Liao Xilong, Chen Bingde, Qiao Qingchen and Jing Zhiyuan, all members of the Central Military Commission. On Tuesday morning, Hu and his entourage first listened to a brief report by the leaders of the newspaper, then visited the website station of the newspaper, the typing and printing workshop, and the office of the editors-in-chief. At the website station, Hu watched the demonstration of the national defense forum on the website, the website in the English version, and also the databank. He also surfed online for the introduction of the 36 Chinese strategists. When meeting with the whole working staff, Hu stressed that the newspaper is the mouthpiece of the party in the military, and an important platform for military publicity. Over the past 50 years, the newspaper has expanded its publicity fields, strengthened its quality and made important contributions to national defense and the building of the military. Hu stressed that national defense and the building of the military are stepping into a new era for development with the whole nation entering a crucial time for building a moderately prosperous society. The military is expected to fulfill its historical task of national defense, holding high the banner of Deng Xiaoping Theory and the important thought of the Three Represents and implementing the scientific concept of development. The current situation has raised higher demands for the publicity work of the military, Hu said. In line with the principles of the Party, the newspaper should stick to the right political direction. Serving the national core interest of economic development, the newspaper should also focus more on the guidelines and policies of the Party and sum up the experience of the military. The newspaper should also provide better services for officers and soldiers, Hu said.